Adored for thousands of years, the exquisite Ruby, with its distinguished bright red colour, is the most famed and fabled red gemstone of them all. Rubies are the red variety of the mineral corundum, which is actually the same mineral that forms Sapphire. To achieve the Ruby’s red hue, the trace element Chromium, must be present, forming the stone’s crystal structure. The chromium fluoresces in sunlight, giving Ruby’s their distinctive glow. The stunning red of the Ruby can range from bright red to a dark reddish-brown and the strength of the Ruby’s red depends on how much Chromium is present – the more Chromium, the stronger the red colour. Though notably desired for its bright colour, the Ruby is also beloved for its durability, lustre and rarity. The Ruby is one of the most durable gems available, with Diamonds being the only gem harder than a Ruby. Our elegant Lotus Ring is a spectacular piece that was inspired by the distinctive shape of the lotus flower. The silhouette of these Diamonds likened to the bold symmetry and romantic lines of a lotus petal, which lead to the creative design that is now our Lotus Ring. 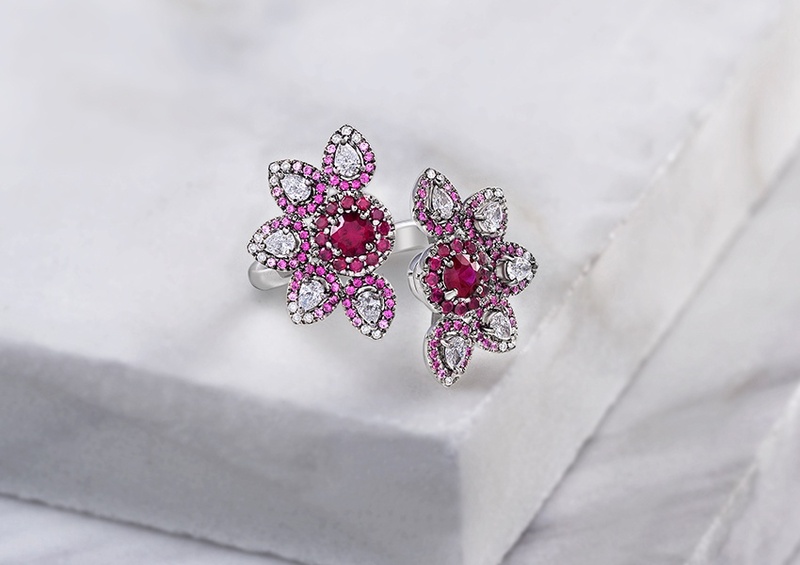 In order to achieve a look similar to a petal of the red lotus flower, we selected Rubies of the finest quality for both the centrepieces and supporting structural elements. To highlight the colour transition, we chose an assortment of smaller Rubies, Pink Sapphires and Diamonds to balance the colour fade out from the powerful red centre on each side. Showcasing a luxury approach to contemporary jewellery design, this unique ring mirrors current trends for minimal, yet colourful and fun jewellery. This piece is more than a traditional dress ring; the Lotus Ring is a glamorous piece that was designed to be worn for high profile events, romantic evenings and during the day for a touch of indulgence. For an insight into the creation process of our Lotus Ring, make sure you are following us on .